Details: Spring is in the air at Kings Dominion! Join us March 30 – April 1 for our Easter Eggstravaganza! Eggward the Easter Bunny and Snoopy the Easter Beagle have teamed up to hide the Easter eggs throughout Planet Snoopy – think you can find them? Head on a scavenger hunt through our 14-acre kids area and see if you can find all of the eggs for a special prize. Then, take a break from the rides for some Easter crafts and activities for kids in Planet Snoopy. Bring a smile and your camera – Eggward the Easter Bunny and Snoopy will be available for photos throughout the weekend. Details: SCC is hosting a Resurrection Sunday service for families followed by a celebration. There will be lots of fun for all ages. 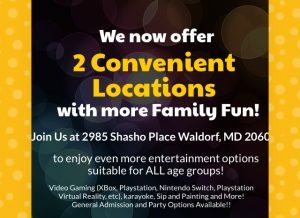 Activities include a fully equipped video game truck and moon bounce! Details: 11:30 AM Easter Mass followed by a egg hunt around 12:30 PM to celebrate the new life we have in our Risen Lord, Jesus Christ! Don’t forget to bring a basket. Details: Middleton Cedar Hill offers wholesome, quality time while having fun with your family. Start your Easter Egg Hunt with a hayride around the farm, enjoy play area and visiting with farm animals and babies.